I've just added some fun Halloween themed hair flowers to my etsy shop. They are a quick and easy way to add rockabilly flair to your costume or just to get in the spirit. As a special gift for my loyal readers, if you are a follower of this blog you can get an extra 10% off your entire total in my shop! Just enter "blog follower" in the notes to seller and wait for me to send you an adjusted invoice. I can also refund to your paypal account if you want to pay right away. Labels: 50s Rockabilly, fashion, hair, holidays, Tart Deco, What's on Sale? There is a new Bettie Page Documentary in the works and yours truly was interviewed at the Chicago Comic-con. They haven't posted the interview footage yet, but when they do I will post about it tout de suite. In a docu-comedy romp through 1950's American pop-culture, the reclusive "Dark Angel," Bettie Page, chronicles the behind-the-scenes story of her rise as a cult icon and for the first time fully reveals the story of her mysterious appearance at the height of her career in 1957. Unseen for more than 50 years and known to the public only by her iconic photographs, an unparalleled mystique has built up around Bettie Page. Here. she reveals the real woman behind the iconic image. Pin-up photographers Bunny Yeager and Paula Klaw, as well as camera club/3-D photographer, Art Amsie, and stripper, Tempest Storm, provide personal stories and insight into the life and career of Bettie Page. Some of Bettie's close friends in her later years give insight into Bettie, the person behind the iconic image – Steve Brewster, founder of Bettie Scouts of America, Carlo Shahumian, neighbor and friend during the last eight years of her life and Devin Devasquez, former Playmate and a confidant to Bettie. This could be pretty cool kids! Keep an eye out for it. 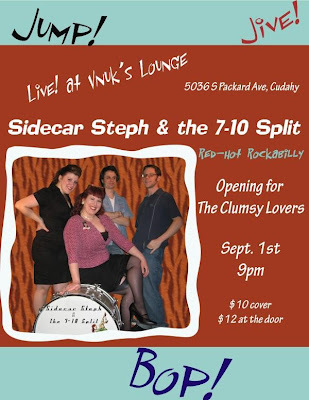 9/1/2009 9:00 PM Sidecar Steph & the 7-10 Split opening for The Clumsy Lovers @ Vnuks! I thought I would take a moment to talk about our wedding music. Being a working musician, the music was incredibly important to me and I spent a lot of time on it. I was lucky enough to have a built-in filter of rockabilly/50s music or it probably would have taken me months to even narrow down my choices! Perhaps a short discussion of how I researched, picked and narrowed down the music will help someone else in their discovery of that "perfect song(s)." The way I approach music research is very organized. First I try to get my hands on EVERYTHING I can that matches up with my theme or emotion. This may seem overwhelming at first, but if you take a look at your wedding planning notes and such, you will notice a thread that runs through it. I then listen to every song and see if it grabs me within the first 10 seconds. If it does, I add it to a cd compilation file (I use Nero) or jot it down. Don't worry if your initial list is large or is bigger than a blank cd can hold. The next step is to go back and listen to those songs again. You may want to do this in a separate sitting from the first step if you had to listen to a ton of music or you may be too tired to stay unbiased. This time I pay more attention to the lyrics and see if I feel an emotional connection. I found that if it makes me cry, I am on the right track. At this point you should try to get the choices narrowed down enough to fit on a cd so you can burn it. Step 3 is to take the cd you just burned and listen to it for a week or so. I call this my car test. I always listen to the music in my car and see how it affects me (and my fiancee) as I am driving from place to place. Certain songs tend to jump out as good or bad and I keep a small notebook in my glove compartment to jot down notes when I reach my destination. I am usually able to narrow the songs down by half this way. After this it really comes down to what fits each element of the ceremony best. Most people want to have something introspective for the processional but upbeat for the recessional. Most songs have a natural flow to them and some are easier to chop down into sections if you need to. If you or someone you kow is handy with sound editing you can modify some songs to fit what you need exactly. I used the Elvis song Can't Help Falling in Love as my bridal processional and took out half of the intro, the second verse and part of the ending to it felt complete to me, instead of just fading it out. It was 1 and a half minutes that way and was a perfect length and the verses included said exactly what I was feeling. Good luck finding your music. It can be an involved process, but if you find the right tunes it makes such a big difference on such an important occasion. Sorry for the lull in posting but I recently got a computer virus that shut me down. A complete format was done and I am currently trying to restore my programs. I will be updating soon! Just a quick diversion from wedding posts- I stumbled on a wonderful website called Myvintagevogue that has amazing images from magazines for various eras, including the 1950s and 60s. Most of them are fashion pics so it is a softer rockabilly look, but the clearness of the photos are super helpful for make-up and hair ideas. As you can see, our dessert table turned out great! 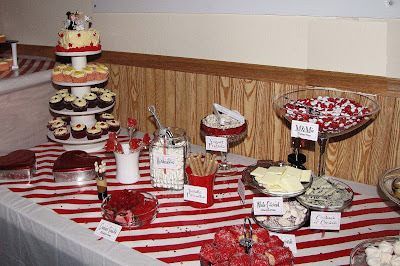 All of the food was red and white (or really close, like pineapple) and we had 3 kinds of cupcakes- gluten-free lemon chiffon (for family members with celiacs), red velvet with cherries, and chocolate- all covered with gluten-free buttercream frosting. I bought the red and white cupcake liners from an awesome shop on etsy called LayerCakeShop. They have animal print liners right now! We also offered fruit with a marshmallow fruit dip and 2 different kinds of white cheeses. The containers were mostly bought at thrift and vintage stores, with the majority purchased at the Waukesha Antique Mall and Fox Riverwalk Antique Mall. I got 4 vases and some candy-striped mini loaf papers for table favors at the dollar store. I also used candy-striped wrapping paper as a runner over white plastic table cloths (an idea taken from Martha Stewart Weddings). 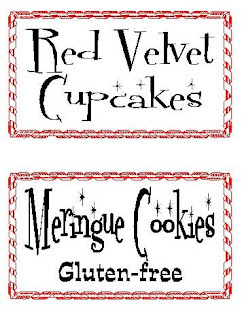 I created labels in Printshop using Fontdinerdotcom Sparkly font and printed out on regular paper. I used the leftover card stock from our invites and cut the same size as the labels. I then cut red organza ribbon pieces about 4-5 inches and "sealed" the ends using a lighter so they wouldn't fray. I sandwiched the ribbon between the paper label and card stock and glued together with rubber cement (makes it easy to reposition if needed). One of my bridesmaids, Annie, helped me by taping the labels to the matching container and repacking them so anyone helping the day of the wedding knew exactly what to put the food in, in case I couldn't help (which of course ended up happening!). The trays that the cupcakes are on are 4 vintage tin T.V. trays that my husband I found at a rummage sale for $5. I hot-glued cake pillars I bought at Michael's to each corner and put a heavy book on them to help set the glue in place. A few pillars did come off in transport to the bowling alley, but I hot-glued them back on and they were fine for the wedding. A piece of candy-striped material behind the cupcakes helped to cover up the microwave and coffee maker behind them. 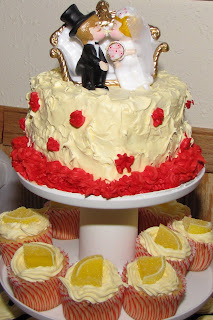 I bought vintage cake toppers on e-bay for a few bucks each and we put them in various places on the table, as well as one on the extra cake my mother made for us to freeze. She used 2 heart shaped pans we bought at Michael's for $7 (which was less with the 40% coupons you can print from the internet). I also got the candy scoops there for $6 for a box of 2. 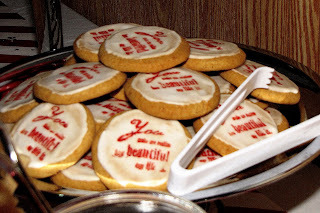 Lastly, we went with stamped cookies, another idea I ganked from Martha Stewart. It looks great, just leave yourself 2 days because the icing needs to set overnight. In the end, its hard to tell that this is a regular corner in a bowling alley. During the ceremony we put a room divider in front of the food to make it less obvious and more special when we "unveiled" it after the ceremony. This was my favorite part of the wedding and cost about $240 to pull off.